Our work focuses on helping clients achieve their goals in their transformation to more collaborative, flexible, mobile and activity-based workplaces. Our workplace surveys, analytics and decision support tools provide a solid foundation of business intelligence that we use to develop workplace strategy and manage workplace transformation. Iometrics worked with Mazda to develop an innovative, brand-based workplace strategy to serve as the perfect catalyst for cultural transformation and brand evolution. The resulting solution offers significant growth flexibility, high-tech collaboration and employee mobility, while delivering a greatly improved employee experience. September 2017. CoreNet Leader. A. Kamouri, J. Lievois, and R. Walsh. Iometrics worked with Apollo Education Group to create a balanced business case for implementing a flexible workplace strategy that quantifies both cost containment and employee benefits, including productivity. This effort helped create momentum for the program and secure leadership support for both new workplace standards and work flexibility options. It was a finalist for the CoreNet Global Innovator's Award. Iometrics’ data-based approach helped Toyota align HR, IT and CRE functions to create and pilot a fully-integrated workplace strategy that supports key business goals and strategies. This approach helped Toyota create a common focus across functions, a deep understanding of key interdependencies, a rationale for integration, and opportunities for workplace innovation. 2015. Corporate Real Estate Journal. (V5.2) M. Chung, S. Verabian, and A. Kamouri. Iometrics helped United Way evaluate workplace scenario options that would support their new strategic business plan, which was to drive internal excellence and foster the type of collaboration and mobility needed to create systemic community change. The process resulted in an workplace strategy that included a mobile workforce, contained costs, and created additional space for headcount growth. Iometrics worked with Cisco on a comprehensive, multi-year workplace research and analytics program that they leverage to drive key decisions. 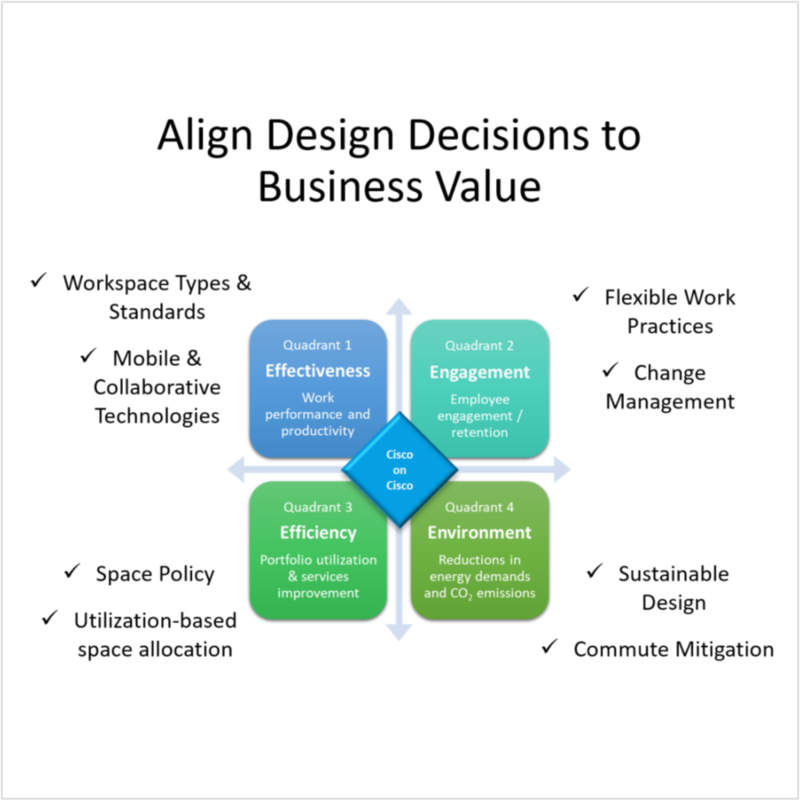 These decisions have changed the design of the workplace, the choice of technologies to implement, and flexible work policies. This data also helped determine quantifiable business value associated with their strategy, including attracting and retaining talent. Iometrics used a series of badge-swipe data mining analyses to evaluate building utilization, understand trends and variances in utilization across organizational groups, and model the implications for alternative workplace strategies including unassigned seating (hoteling). The results helped ServiceSource explore options for improving their space utilization and efficiency. Iometrics worked with Cisco to analyze data on worker profiling, workplace satisfaction, human resource impacts, and flexible work practices and integrate with workplace data. The results have been valuable in strategic portfolio planning, gaining support for new initiatives and for making the case for change within CRE. The resulting insights and intelligence supported CRE credibility and relevance in the eyes of executive management. Iometrics worked with Sun to apply data-driven approaches to select appropriate distributed work strategies, design the supporting system of infrastructure necessary for success, and provide direction to implementation strategies. This work supported the iWork program that was deployed across the global portfolio and successfully delivered on cost-containment as well as employee satisfaction goals. 2008. The Handbook of High Performance Virtual Teams: A Toolkit for Collaborating across Boundaries. Josey-Bass. A. Kamouri and E. Richert. Iometrics shared best practices from global clients who applied user experience approaches to address workplace challenges and drive critical decisions. This presentation explored how workplace data and user experience approaches are used to unlock insights and drive the development of workplace solutions that deliver business value through an improved employee experience. Iometrics used a rigorous data-based design approach to help eBay create a flexible workplace solution that promotes collaboration, productivity and a dynamic company culture. Post-change results from each project were iteratively applied to the workplace strategy as it is implemented throughout the portfolio to support continuous evolution.